The current research reports 61 male serial murderers’ responses to self-report questionnaires designed to assess levels of psychopathy and criminal thinking. Three separate measures of psychopathy were included. Contrary to our predictions, results indicated that our sample of serial murderers did not demonstrate strong evidence of psychopathy. Rather, the percentage of inmates who could be classified as having psychopathic tendencies is on par with the general population of prisoners. Only half of the participants had an interpretable criminal thinking style scale. 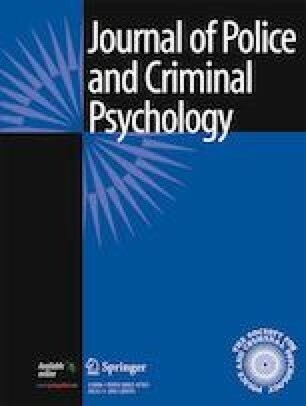 Temperament and power issues were the two factors of greatest significance for understanding the serial homicide perpetrators’ criminal cognition. In line with expectations, multiple significant correlations were observed for the measures. Implications and limitations of the research are discussed. Thanks are extended to Adrienne Freng for her assistance in the development of the project and to Kathyrn Nicola, Janelle Klemm, Alicia Young, Ellen Watson, Rebecca Luze, and Alek Johnson for their assistance in data collection. This research was supported in part by the President Tom Buchanan’s Foundation Fund at the University of Wyoming, the Arts and Sciences Dean’s Office at the University of Wyoming, and the Department of Criminal Justice at the University of Wyoming. Measures the willingness to manipulate another person for one’s own selfish means. Having a cynical view of human nature and a tendency to augment rules and regulations to one’s advantage. Perceived superiority of other people and propensity for deception. Measures the expression of anti-authority attitudes and a reckless disregard for the norms of society. Scores are also indicative of a rebellious nature and a tendency to make multiple life changes as a result of boredom. Measures a lack of personal responsibility for life as evident by the perception of mistreatment from an unfair world, bad luck, or other people’s actions. Tendency to play the victim. Measures a failure to plan ahead and an unwillingness to consider other strategies for problem solving life events. A person who acts without thinking of the consequences, has limited/no long-term plans for life, and does not learn from previous mistakes. Measures an individual with charm and the ability to influence others. Scores reflect a person who can be chatty, unanxious about interacting in social events, confident, and make a good impression on others at first glance. Measures those generally lacking in a normal amount of anxiety related to risky situations or physical confrontations. A person who takes chances or risks and lacks fear of danger. Measures behaviors reflective of a calm individual when under pressure. Also reflective of an absence of nervous habits. Measures a lack of personal attachments and in feelings of guilt or empathy when others are suffering. An absence of caring emotional traits, which are replaced by a tendency to be callous. Measures “a selfish, uncaring, and manipulative posture toward others” (p. 152). Measures impulsivity and the tendency to lead a self-defeating lifestyle. Measures one’s tendency to lie and manipulate others. Measures a general lack of empathy toward others, as well as a lack of concern for their well-being. Measures a tendency to lead a life style with reckless behaviors, as well as impulsive behaviors. Measures the antisocial lifestyle of the participant, as well as demonstrated criminality. Justifying a person’s actions, while also blaming the individual’s environment. Refusing to take responsibility for one’s actions. Low emotional control, and explosive reactions to even slight provocations, as well as a “rapid elimination of deterrents to crime” (p. 6). A mistaking wants for needs and a sense of privilege, or a feeling that one is unique and deserves special attention from others or society. Needs include power and control of all life situations, as well as the drive for more power in life or the exertion of control over the environment. A selfless behavior pattern of doing for others, but also with the superficial purpose of clearing the conscious for criminal deeds or mistreatment of others. Failing to recognize harm done to others. A thinking style that minimizes the consequences of criminal actions, as well as a tendency to act incredulous at failed criminal enterprises. The tendency to take short-cuts in life and avoid problems, as well as the inability to think critically about resolving situations. A lack of following through with promises or commitments. A person perceived as flighty or unpredictable. One’s identification with his current criminal belief system. One’s past identification with his previous criminal belief system. A tendency to avoid problems by engaging in defeatist activities, such as crime and/or drug use. “Extreme hostility leading to confusion or the appearance of confusion” (p. 51). The person’s willingness to hurt others for the purpose of achieving his goals, even if the goals are unrealistic. One’s rationalizations for the harm done to others in the pursuit of criminal enterprises, as well as the minimization of damage inflicted. The resistance to change by an individual resulting in difficulties by others to intervene and correct behaviors.